Here's another seafood recipe from Eric's kitchen. It's actually from a cookbook I took from my Mom a long time ago called Mystic Seaport's Seafood Secrets Cookbook. It's the first version from 1970. Why mess with a good thing? I was recently flipping through it this past weekend trying to compile a list of recipes I wanted to make when I saw this dish and thought, sounds unhealthy and decadent, and it features a few of Jenn's favorite ingredients, scallops, mushrooms and cream sauce. I should try it! Oddly Sasha had been following a similar line of thinking across the rivers in Brooklyn when she made her Scallops with mushrooms in a spicy lemongrass thyme coconut broth. The recipe said you could use half spinach fettuccine and half regular and use frozen Spinach. I however, never see any point in using frozen veggies when you have access to fresh ones. First, you saute your mushrooms and peppers in olive oil and a small amount of truffle oil. Once the mushrooms and peppers are tender, add the spinach, and stir until wilted, but not too long so that it doesn't get mushy. Remove these from the pan and set aside. 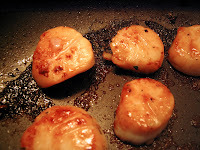 Rinse the Scallops and pat them dry with paper towels to ensure they brown properly. Using the oil left in the pan, sear the Scallops on medium to medium high heat. The pan may have some burned spots but this is good. Measure out your white wine and pour a little in at a time as the pan starts to look too dry and continue until they are done cooking. This de-glazes all the rendered fat from the seafood and oil and also helps the scallops brown and creates a nice sauce to cook them in. Anytime you want to brown something in a pan, also leave some room between them pieces and don't touch them for a bit. Fussing too much with them can keep them from properly browning. Once the Scallops are seared on both sides, remove them and place them with the veggies and cover them to keep them hot. I've heard many people complain about not being able to properly sear scallops in a non-stick pan, but I think it did just fine tonight. Next is the sauce! This is mostly the cookbook's recipe as I probably wouldn't normally use evaporated milk or cornstarch but I'd never really tried this before and didn't want to re-invent the wheel. So you heat 4 tbsp of olive oil, and 6 tbsp of water in a saucepan with the garlic and white pepper. Slowly pour in the evaporated milk almost until the mixture boils. Drain and remove the scallops and veggies and pour in the liquid to your sauce. Stir in the cheese until melted. Mix the cornstarch with 2 tbsp of water and add to the sauce, stirring until it thickens. At this point I tasted the sauce and was a little unimpressed with how bland it was. Jenn and I are a big fan of how one of the local bars, Iron Monkey, serves popcorn with truffle oil and cajun spices which gave me the idea to add some truffle oil and cajun spices! This did the trick. It was a little spicy and more flavorful. I stirred all the ingredients together in a dish with the fettuccine and served it with some white wine and some more Parmesan cheese. It was very decadent and delicious! I wish I had plated it with everything mixed in except the scallops and then placed them on top to show off their nice sear but it certainly didn't detract from the taste. 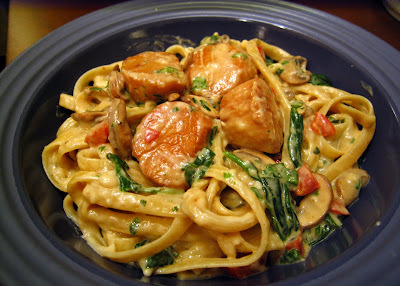 Oh, we had something very similar last night - scallops with pasta! Sounds terrific with the addition of truffle oil!